As promised, I am going to start the new format of the blog. Now, I'm sure there will be a lot more to improve in the site, but knowing that I have a concise scheduling of posts is a great way to start the improvement. I wanted to share with you the outfits that I wore for my birthday weekend starting with May 23rd. On the 23rd, my boyfriend took me out to dinner and we saw the midnight screening of Fast and the Furious 6. It was a good movie, but I'll tell you about that on a different post. Anyway, for my look, I wanted to dress up a little. I wore a little gray dress with a shawl neckline and long sleeves. Here in Chicago, it gets pretty cold a nights even during the Summer season. The neckline was too low for my so I wore a black spaghetti strap underneath. I also added a sparkling gold belt to accentuate my waist. I paired it up with another sparkling gold pumps. I think the sparkle helped the outfit and turned it into a night outfit. I made sure that my earring were big and made a statement, since my neckline was already an accessory on it's own, I didn't wear any necklace. I also embellished on a statement ring and a really cool charm bracelet. 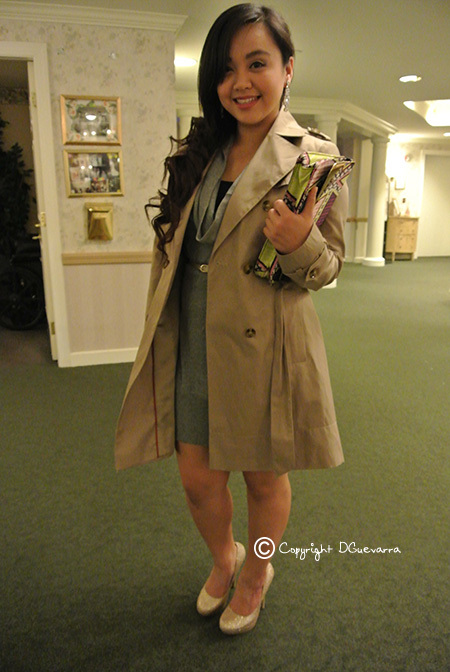 I had to wear my trench coat that night due to the rain, but I think it made the outfit look so sophisticated. I added a pop of color and print with my clutch. The tribal prints and colors gave my look the liveliness it deserved. I had my friend help me with my hair since I wasn't as used to creating look with my hair. She gave my hair a very polished look. She had the curls all in one side to create that prim and proper aura. 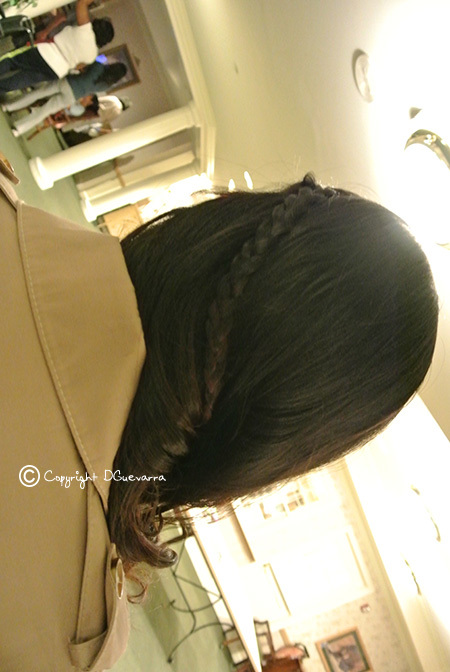 She added a little fun in the back too with a nice braid. I got the dress from Metropark. It was an old dress that I have never worn. I'm glad I have finally gotten it out of my closet. The dress I got from For Love 21, if I remember correctly, I think it was about $16. My coat is by Tommy Hilfiger, I got a bargain deal from Ross for $60.Finally, my fun clutch was purchased from H&M for $5. For the second day of my birthday weekend, I wore a floral print dress which is also from H&M. I got it for $25. I love the crazy floral print, but I the love cut of the dress even more. I feel that fit is one of the best things you can find in a garment. I'll tell you more about fit in another post. Since my dress was already crazy printed, I didn't want to put a lot of accessories. My stack-up bangles and brown statement ring which are both from Aldo, and a multiple string necklace I got from the Philippines were my only accessories. .My fuchsia pink wedge from Charlotte Russe completed this look. For the last day, I stayed very casual and very comfortable. 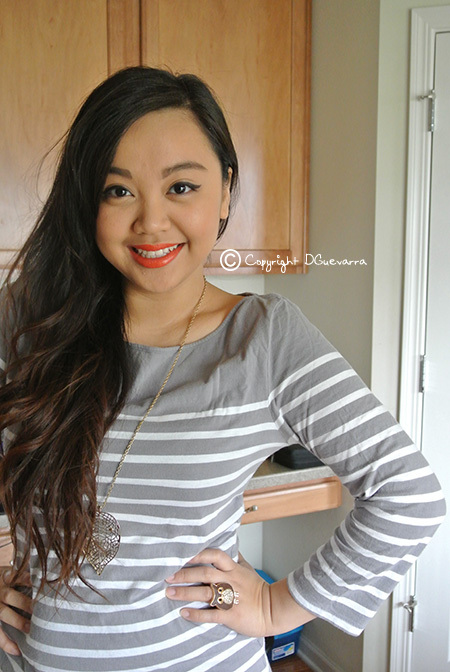 This gray stripe top was purchased at Old Navy a couple of seasons ago, so forgive me if I forget some of the prices of my items. :( This pastel peach colored pant that I'm wearing is from Ross. I got it for $9 on clearance. The leaf necklace is my friend Shannon's that I borrowed. I got my owl ring for $3 from DEB. Finally, these hot bright purple Jessica Simpson wedge is from Ross for $20. I hope you are getting the idea that I love deals. :p I will have posts of how to copy an expensive look under $100, so watch out for it. Create looks that make you feel beautiful. This in turn will boost your confidence and you'll carry the outfit better.